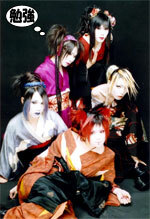 Kagrra is a visual kei band, originally signed to the Key Party Records label (now defunct) as "Crow". When they changed labels, the group changed their name to Kagrra. The group is referred to as having "Neo Japanesque Style". In the early days of their career they typically wore kimonos on stage. After their 3rd major label single, they would switch to wearing normal clothes with a slight Japanese style flair to them.